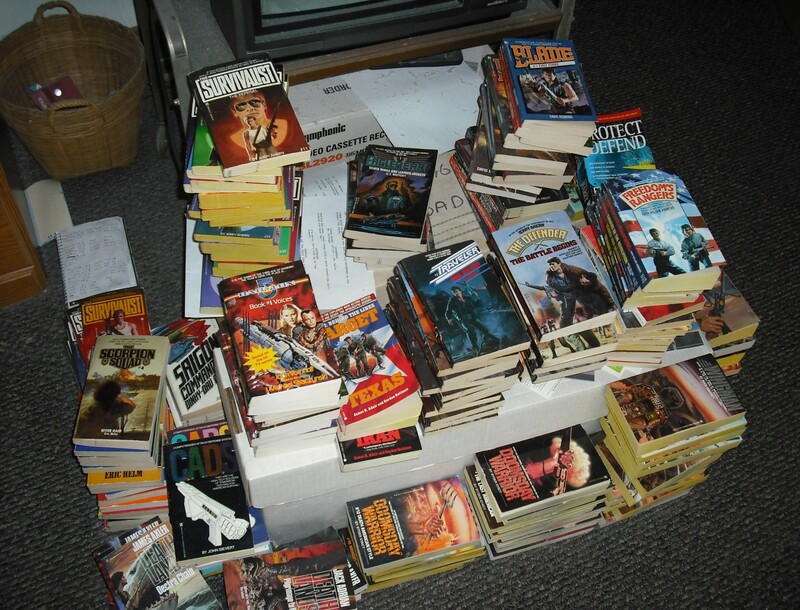 The Scorpion Squad – THE BOOKS THAT TIME FORGOT. The VC are building up with supplies brought down the Mekong River in sampans. The ground ambushes are proving ineffective in stopping the flow of weapons. What is needed are boats to intercept the sampans. Of course General Crinshaw is against this idea so Gerber and his green berets steal a boat and modify it for combat. It is a success and through unofficial channels a joint Army-Navy operation is launched just before Christmas code named River Raid. 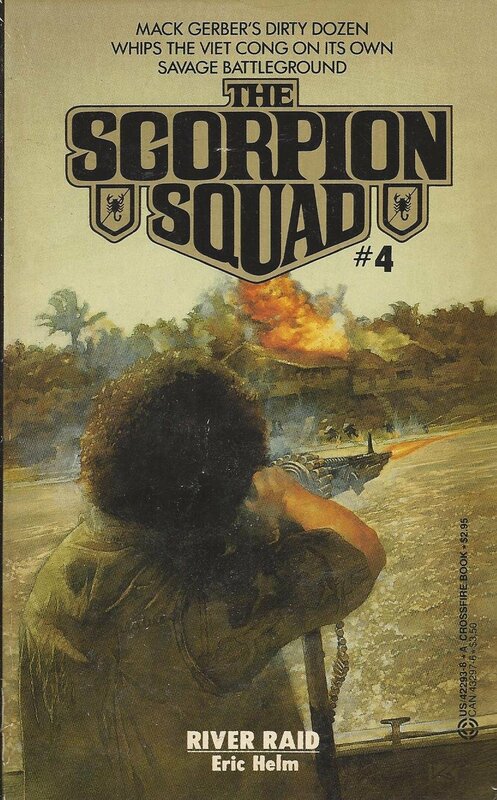 The fourth and last book in the old Scorpion Squad series. It was also the first in this series I ever read so it has some sentimental value with me. I do think it is the best in the four books of the old series. There is a fair amount of humor in it. The boat they steal turns out to be General Crinshaw’s private boat brought over illegally at taxpayer expense so the general could water ski. There was also a new character Vladimir Schmidt. A weird pasty man who always wore sunglasses and never seemed to be around in the day. When he was in the daylight he got sick and need blood transfusions. VC were found with their blood drained from puncture holes in their neck. Seemed Sgt. Schmidt thought himself a vampire. In the end he died from a trap he tripped, a crossbow that shot a wooden bolt through his heart. So this book dealt mainly with the beginnings of riverine operations. It was interesting to read about this. The VC once again massacre another village. This was because they turned against the VC after an overzealous cadre murdered the schoolteacher because she rejected him. So they had to destroy the whole village with flamethrowers. 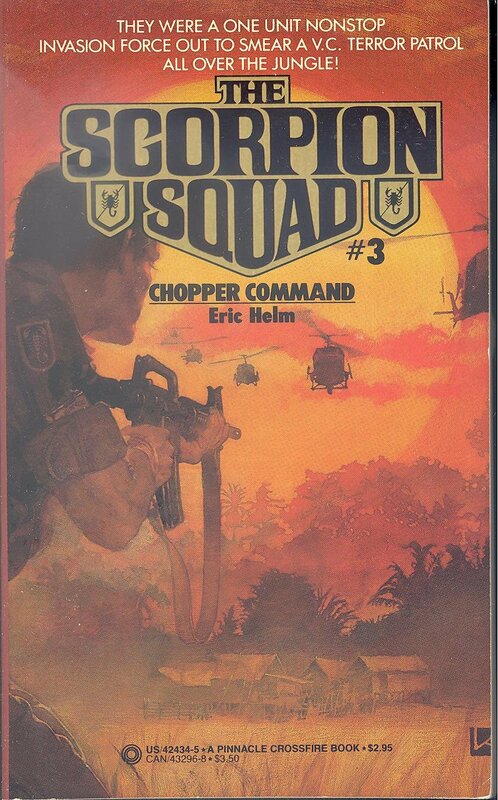 While this was the last in the misnamed Scorpion Squad series it is not the end for Captain Mack Gerber and the Green Berets of camp A-555. There is a VC propaganda squad operating in the area. They slip across the border from Cambodia and terrorize the local villages. Guarded by a company of NVA they are acting with impunity. Mack Gerber wants to put a stop to them. For that he will need helicopters to insert his men quickly before the Cong can slip across the border. The third book in the series is another exciting entry. This explores the beginnings of using helicopters in the war to move men quickly in an inhospitable country. This was a crucial component in fighting the war in Vietnam. Also we are shown the casual brutality of the VC. They massacre a village after the Green Berets successfully ambush them during one of their propaganda speeches. The VC didn’t want word of the humiliating defeat to get around so they destroyed the village. They would do this several times throughout the series. They also show the presses total lack of any interest in such incidents because they are so common. A very cynical and callous policy the VC waged. Mack Gerber and the men of camp A-555 get a well deserved leave after successfully defending the camp against a VC regiment. But no sooner then they land in Australia when they are called back. A U-2 spy plane on a mission in China was flying over North Vietnam when it goes down. The pilot is held captive at a NVA base at Nhu Ky. Now Gerber and his green berets must parachute into North Vietnam and rescue the pilot. After a successful breakout they then have to track down the U-2 to retrieve the photos it took before the NVA get it. Luckily they make friends with the ethnic Nung Tai people who help them. The second book in the series is a much stronger one than the first. The covert operation in the north was an exciting mission. Shifts the action to a whole new area of the war. Some things established are a growing romantic relationship between Gerber and an Air Force nurse. A mysterious Chinese advisor who was briefly present in this book and the first. He will become a somewhat regular nemesis in this series. It also had an interesting tie in with real life events. We find out at the end that their escape to the destroyer Maddox resulted in the Gulf of Tonkin incident. This incident was North Vietnamese patrol boats firing on the destroyer. It was used by President Johnson to escalate the war. Very clever idea. A lonely hill near the Cambodian border is transformed overnight. Three hundred men are working to construct special forces camp A-555 nicknamed the Triple-nickel. Captain Mack Gerber and his A-team of green berets are advising several hundred Vietnamese popular forces, ARVN special forces and Tai mercenaries. The mission is to establish a presence in territory that has long been ruled by the Viet Cong. The Cong know that once the camp is finished it will be nearly impossible to dislodge the Americans presence in the region. So a regiment of VC are assembling across the border in Cambodian to strike while the camp is still vulnerable. Gerber has to not only fight the VC but the incompetence of the South Vietnamese allies and his own general. The first book in a new series. There is no Scorpion Squad. Its never mentioned in the book. I guess it was some marketer who came up with the title. Figured it sounded cool. I suppose it does but a very inaccurate title for this series. 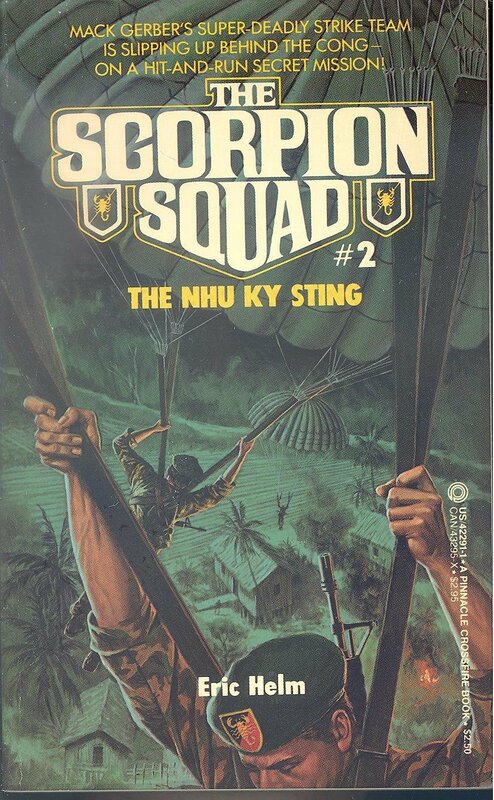 I will say that it is still one of the finest Vietnamese action series ever written. It takes place in 1964 before any large scale American commitment and the US forces were still mainly in an advisory capacity. It shows the myriad problems with the conflict. The impunity that the enemy was allowed to operate in Cambodia without fear of reprisal. The incompetence of the South Vietnamese. The commander of the ARVN would rather lay around in a hammock and drink cocktails. And then there is the general who constantly calls Gerber back to Saigon so he can berate him for fighting the enemy because according to intelligence there is no enemy in the area. A very good start to a long running series about the Vietnam war. In addition to plenty of action it was very educational about the conflict. 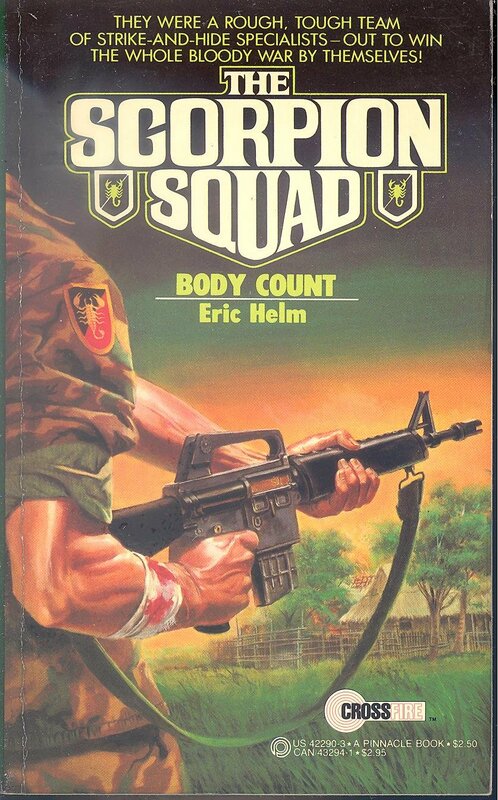 Eric Helm was a pen name for two veterans and it had an authenticity about it and also always includes a glossary at the back for all the military terms.